And when looking into the eyes of a Shih Tzu you will undoubtedly see love. But sometimes you will see something just isn't right. Shih Tzu eye problems are not uncommon. Unfortunately, these problems cause discomfort, irritations and in some extreme circumstances, vision loss. However, with attention and care on a daily basis, you can recognize many of the symptoms before it develops into a serious issue. These distinctly protruding eyes are prone to irritation caused by dirt, dust or even pollen if the dog suffers from seasonal allergies, in addition to being vulnerable to external injuries from table corners to cat's claws. While all dogs eyes should be periodically inspected and cleaned if necessary, the Shih Tzu eyes need to be cleaned every day. Excessive bulging of the eyes causes continuous watering that can provide an excellent breeding ground for bacteria. Inflammation of the cornea can occur also as a result of the Shih Tzu having shallow eye sockets and extremely flat noses. This type of skull formation inhibits proper closure of the eyelids. Keeping hair around his eyes trimmed so that it does not touch or lay on the eyeballs is also important in preventing irritation which can cause excessive tearing. 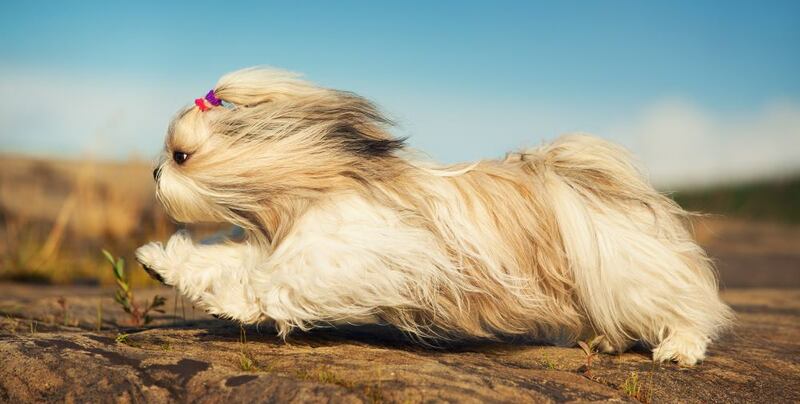 Developing cataracts commonly happens to older Shih Tzu who are at least seven or eight years old. Cataract growth is genetically inherited in pure bred Shih Tzu and cause a white film to cover the eye, eventually causing blindness without treatment. To remove these cataracts, surgery is implemented usually with successful results. Although this operation will remove the chance of blindness, he may subsequently experience a slight reduction in vision. Due to their protruding eyes, a corneal ulcer generally develops as the result of an injury to the eye, such as a scratch deep enough to allow the cornea to be exposed. Because these scratches are not visible, you may not know your precious pup is experiencing a scratched cornea. All these are indications that your dog may be suffering from a corneal ulcer which causes pain when touched by the inside of the eyelid. Treatment will be daily doses of prescription eye drops until the tear has healed. Eye infections happen to Shih Tzu frequently because of glandular secretions which lay on the fur below their eyes unless frequently cleaned. Build-up of this matter attracts dirt and bacteria which eventually leads to an infection. Antibacterial eye drops are used when an infection is diagnosed by a veterinarian, along with constant removal of the secretions by the owner until the infection is gone. Pink eye is a common type of infection seen in this breed, as well as other dog breeds. Shih Tzu are also predisposed to experiencing prolapse of the gland of the third eyelid, also referred to as "cherry eye". This happens when the gland within the third eyelid emerges from its normal spot in the eye and becomes extremely swollen and "cherry" red. Treatment for this health issue is simply surgical repositioning of the gland. 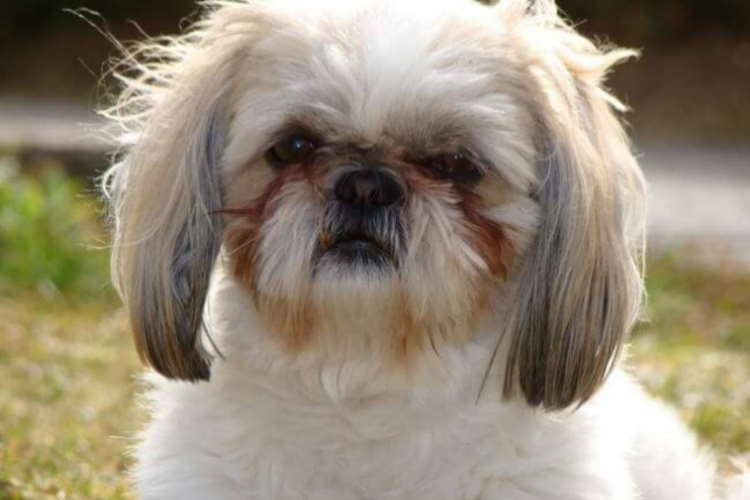 Proptosis is another eye problem affecting Shih Tzu and other breeds with bulging eyes, short, flattened noses and shallow eye sockets such as the pug and Boston terrier. When proptosis occurs, something that is almost always due to a severe trauma to the head, the entire eyeball has become displaced and is not even situated in the eye socket anymore, causing the eyelids to become trapped behind the eye. Unless emergency treatment is administered, blindness can result as a consequence of restricted blood flow to the injured eye. One of two things can be done in this case--either put the eye back into the socket or remove the eye if it is too damaged. Your dog may wipe his eyes a lot, as these eyelashes will cause irritation. You can usually see the eyelash affecting your dog and will have to be treated by a veterinarian, whereas a plucked eyelash will only grow back. Because Shih Tzu eyes are vulnerable to a variety of health issues, they should be always be watched for any signs of abnormality by the owner and taken to the veterinarian at the first sign of distress. I just thought you might want to mention on your blog that my husband and I have had success getting rid of the gunk that oozes from most shih tzu's eyes by giving our shih tzu Zoe a teaspoon of organic virgin coconut oil daily. We use to have to clean her eyes daily, sometimes twice, and now we do not have to ever clean them.